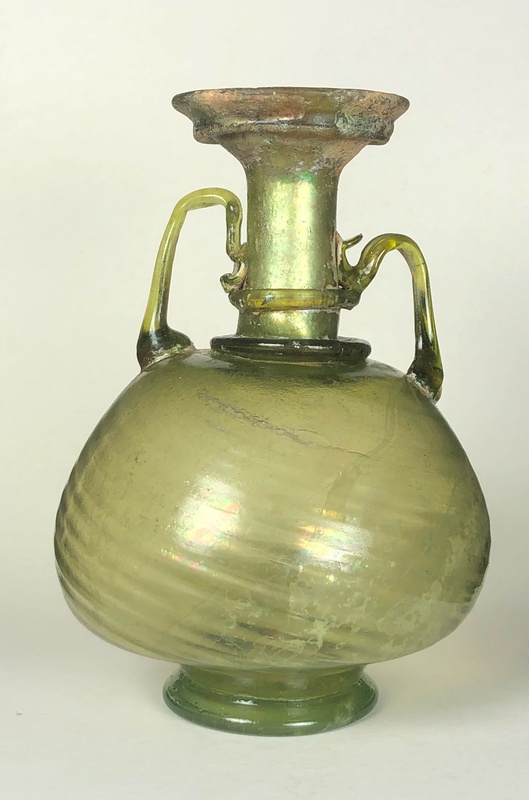 Description: A tall neck bottle with funnel mouth is decorated with two coils and a third placed where the neck meets the body. Faint diagonal ribs are present on the bulbous body which is angled in at the bottom and finished with a coil ring. It has a pontil mark. 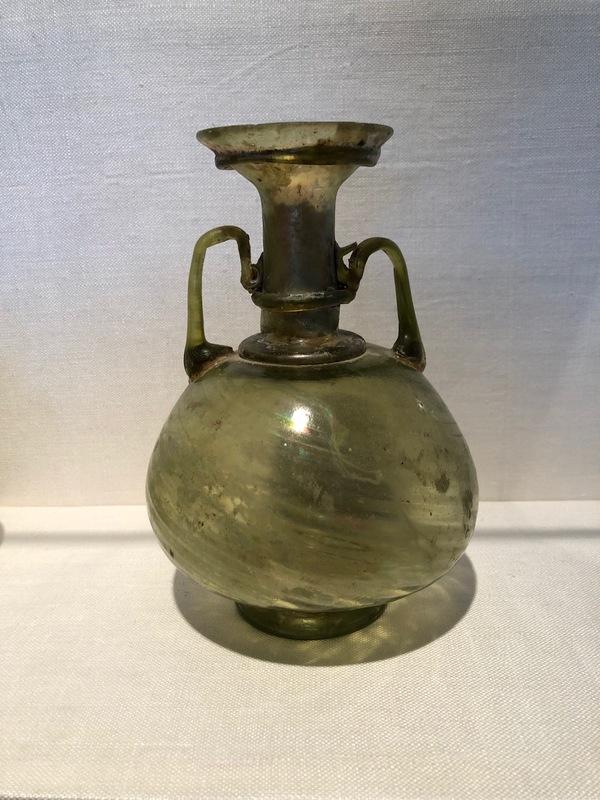 The transparent yellow glass of the vessel is also used for the two applied handles laid on the shoulder and pulled up with a fold over just above the center coil. Condition: Minor stress cracks, silvery iridescence on the inside and faint iridescence on the body. 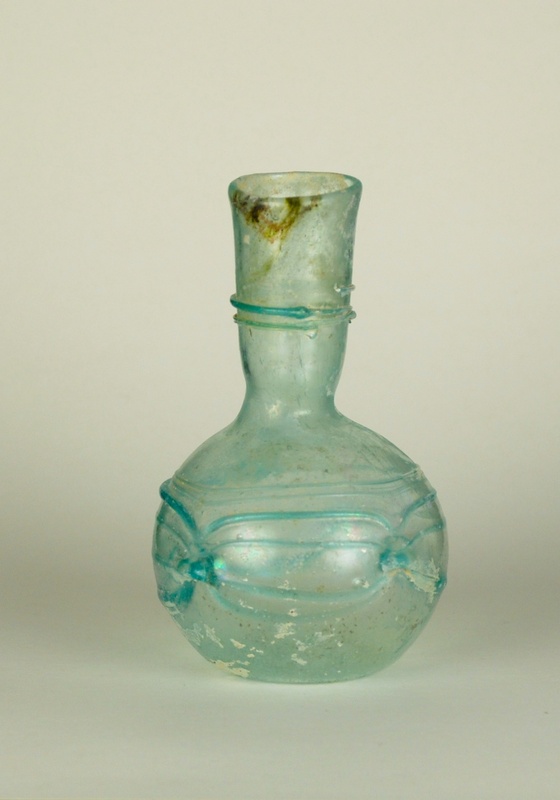 This vessel has been cleaned using the method out lined in CLEANING ANCIENT AND ARCHAEOLOGICAL GLASS. Below is the before picture. 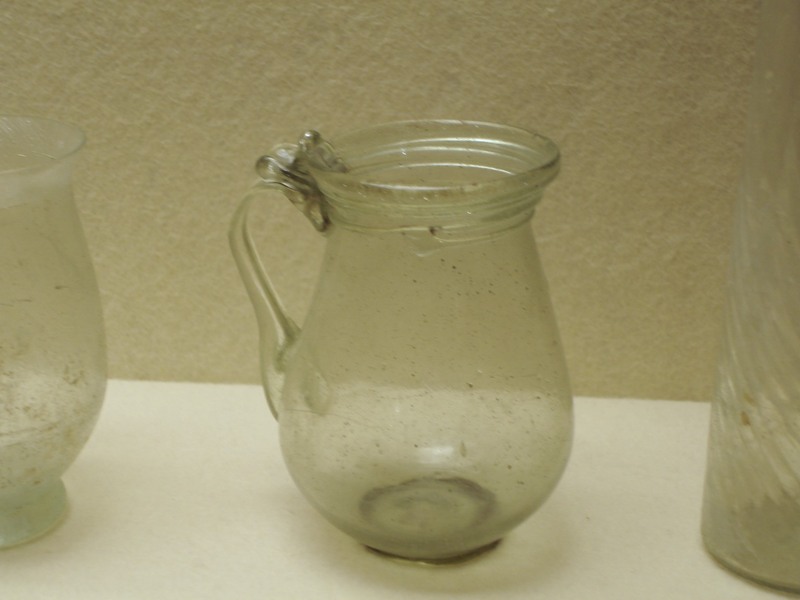 Gallo-Roman beaker 115E was made in the beginning of the Migration Period in the Western Provinces. 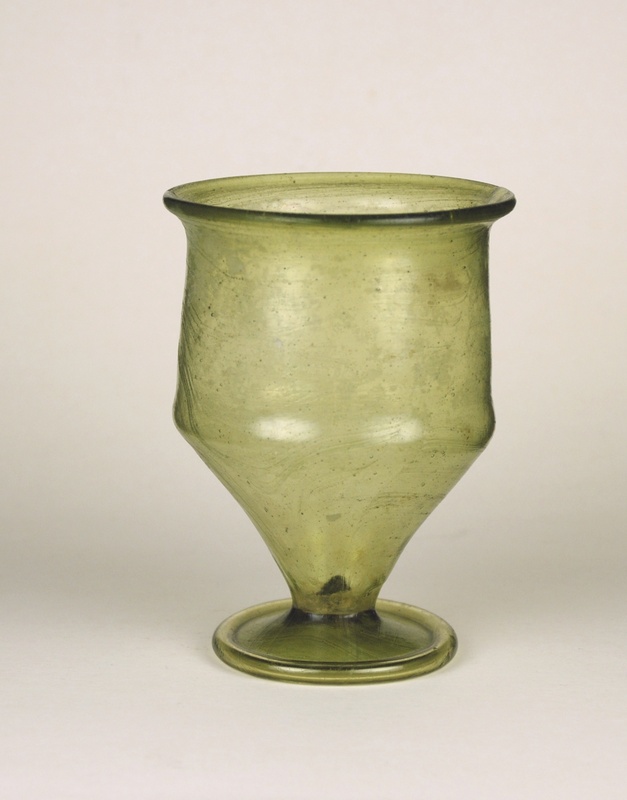 The elegantly formed beaker is made of light olive green glass with the conical bottom standing on a flat base ring. Intact. Ex: Martin Wunsch collection, NYC. 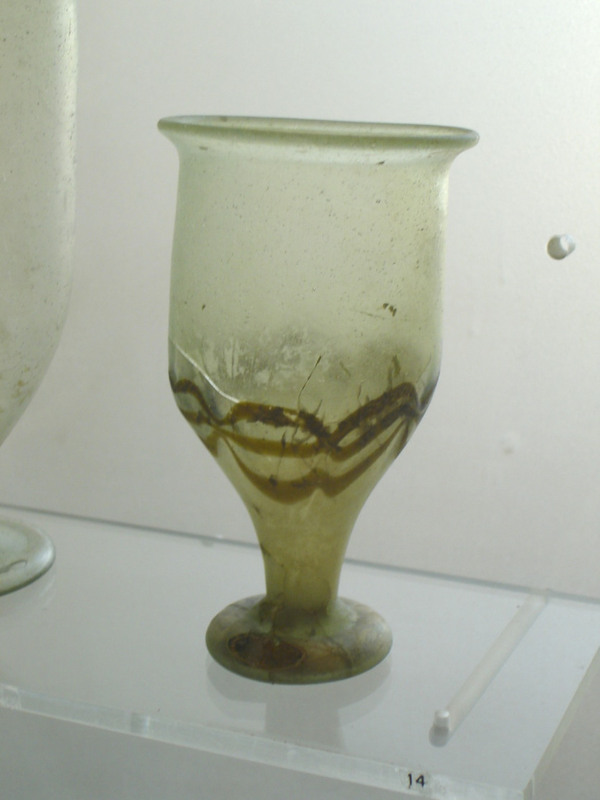 Below is a glass which shows a design change from late Roman to Merovingian. The glass is in The Musee d Archeologie Nationale in St Germain. The museum is a major French archeology museum, covering among other areas Roman and the Merovingian period. This beautiful flask is made of cobalt blue and opaque white glass made to imitate marble. The form is pear shaped. Description: This distinctive jug has a spherical body which rests on a thick base. A tall tubular neck extends upwards from the body and terminates into a splayed lip. Below the lip is a thick glass trail. A wide handle is pulled up from the shoulder where it is tooled into an elaborate triangular finial.